These have got to be the easiest quick pickles (aka “quickles”) you can make. Not only do they add a tart crunch to tacos, sandwiches, and salads, but their fuchsia hue adds a gorgeous pop of color. Keep a jar in the fridge—they are best the first week you make them, but will keep for several months. 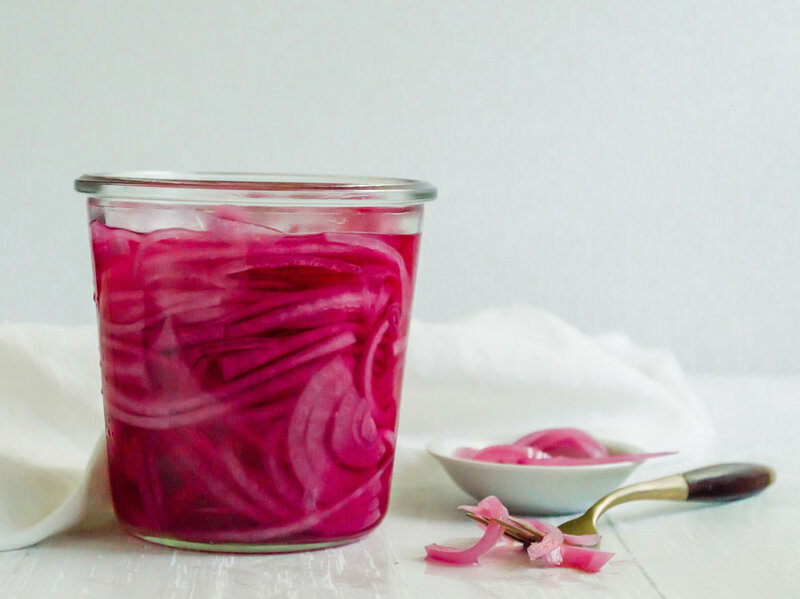 Pack onion into a jar with a tight-fitting lid. (I used a 19.6-oz. Weck jar). Combine vinegar, water, sugar, and salt in a small saucepan over high heat. Bring to a simmer and cook just until sugar and salt dissolve. Carefully pour vinegar mixture over onions in jar. Cover with lid, and let stand at room temperature 1 hour to cool. Refrigerate until ready to use.